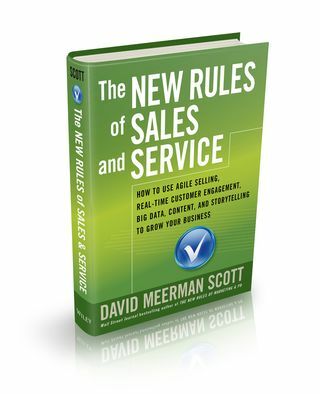 The New Rules of Sales and Service - my new book - releasing soon! My new book, The New Rules of Sales and Service: How to Use Agile Selling, Real-Time Customer Engagement, Big Data, Content, and Storytelling to Grow Your Business is nearly ready to ship. The New Rules of Sales and Service is about how the buying process has radically changed and how people who understand that change can grow business now. Buyers are now in possession of unlimited information so online content is quickly becoming the dominant driver for commerce. Unfortunately most organizations are still using traditional selling and service models developed for a different time. It’s looking like books will ship from USA online retailers and be stocked on shelves at physical bookstores on September 3, 2014. Outside the USA will take a bit longer. To launch The New Rules of Sales and Service by getting some books into the market upon release, I am offering a one-time special for organizations ordering multiple copies of the hardcover book. I’ve worked out substantial discounts from the $28.00 retail price for multiple copies from several USA retailers. If you buy 100 or more books, I’ll do a free webinar or similar virtual event for your employees or clients. I normally charge $5,000 for a virtual appearance. You’d need to buy the books by the September 5, 2014 and do the virtual event by the end of 2015. Contact me for details. If you book me by September 5, 2014 for a live speaking engagement at an event anytime in 2014 or 2015, I’ll provide up to $5,000 credit on my speaking fee for books that you purchase by September 5. (If you buy $5,000 in books, I knock off $5,000 of my speaking fee.) Contact me for details. So you can get your copy as soon as possible, now is the time to pre-order your copy. I’ll be sharing much more about The New Rules of Sales and Service over the next few weeks. Thanks for your interest.